The Restore Ubin Mangroves (R.U.M.) Initiative is for all those who care about restoring mangroves to the abandoned aquaculture areas at Pulau Ubin. The Initiative brings together the community of experts from tertiary institutions, NGOs, Ubin commercial enterprises and villagers that depend on mangroves, and individual enthusiasts, with the support of NParks and the corporate sector. More about the members of R.U.M. R.U.M. was proposed within the framework of the “Friends of Ubin Network (FUN)” initiated by Minister Desmond Lee. R.U.M. was proposed in Dec 2014, and formal approval was obtained in Jan 2016. A clip about R.U.M. thanks to Nor Lastrina Hamid. How does R.U.M hope to restore mangroves at Pulau Ubin? As the R.U.M. logo suggests, we hope to let Mother Nature do the planting! Also known as Ecological Mangrove Restoration (EMR), this is done by creating the ideal conditions for mangrove babies. 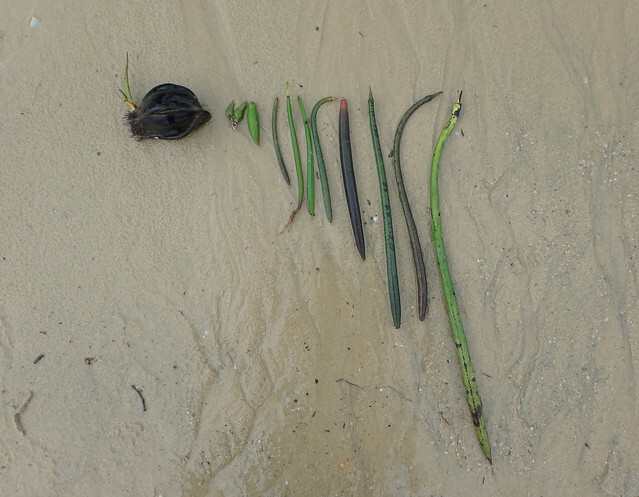 Mangrove seeds and seedlings will settle and grow naturally in suitable conditions. But like Goldilocks in the story with the three bears, conditions must be 'just nice'. Young mangrove trees growing naturally where it's 'just nice'. The water level should not be too shallow or too deep for the mangrove seedlings. Water flows not too fast or too slow. In conditions that are 'just nice' for them, mangroves will naturally flourish. and grow best at different depths. If we just plant mangroves without considering these factors, the seedlings will die. Wasting time, effort and money. Until we fix the ground conditions, planting will continue to fail. Why is Ecological Mangrove Restoration better than planting mangroves? Instead of planting, it is also better to create conditions for mangroves to naturally establish because Mother Nature plants a rich forest. That is, many different kinds of trees and plants will settle, instead of one or a few kinds in typical planted mangroves. 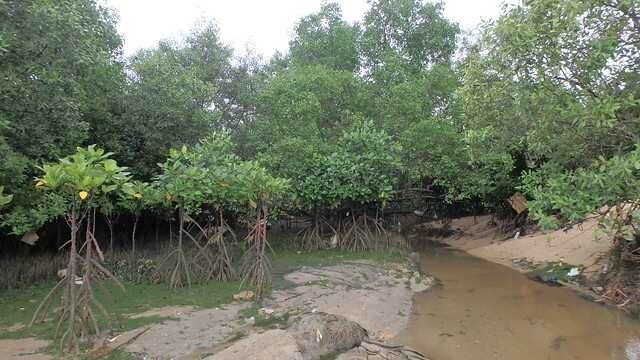 A natural mangrove has many different kinds of trees. 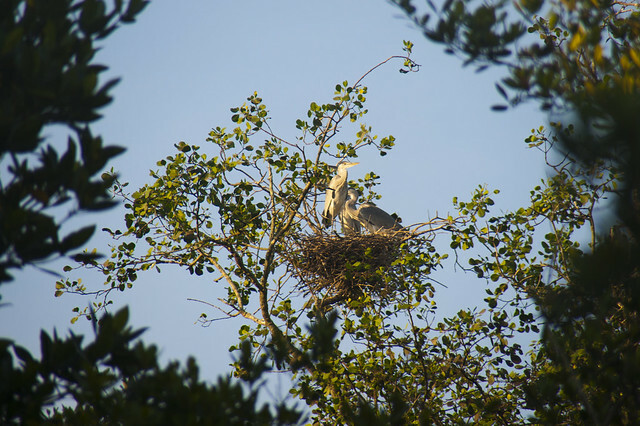 A natural mangrove forest tends to support a richer diversity of wildlife as different kinds of trees and plants provide a wider variety of shelter and food. It will also be more resilient to disease. a wide variety of animals from air, land and sea. Thus, a natural forest will be better at providing good water quality and other important ecosystem services such as a nursery for seafood that fish farmers and fishermen rely on for a living. By re-creating 'just nice' conditions for mangroves, Ecological Mangrove Restoration aims to give Mother Nature a hand. Thus allowing mangroves to naturally establish in abandoned aquaculture ponds. How is Ecological Mangrove Restoration done? Ecological Mangrove Restoration is somewhat like doing surgery to restore someone's health. Before we do the surgery, we need to do a non-invasive MRI or X-ray to find out the ground conditions. Only then will we know how to do the surgery with minimal harm to the person, and maximise the chances of full recovery. 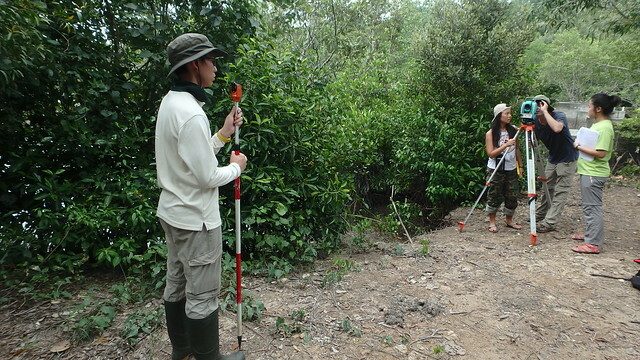 Step 1: Understand the ecology of natural mangroves at the site. Where are they settling and growing well (establishment)? How are they doing: producing seedlings? This tells us what conditions are ideal for mangroves to establish naturally at the target site. Step 2: Understand the water flows (hydrology) that controls the distribution and establishment of mangrove seedlings. Step 3: Assess the barriers to natural establishment. These could be water flows (hydrology), or the shore is too low or too high (elevation). Step 4: Select the appropriate site to restore through Steps 1 to 3. Step 5: Recreate the appropriate hydrology by dealing with the barriers to natural establishment. Step 6: Plant seedlings if establishment is too slow or a higher tree density is desired. Scientists mapping the ground conditions. Also mapping a natural mangrove forest. Has Ecological Mangrove Restoration been tried before? And was it successful? Ecological Mangrove Restoration has been often practiced in the US to create numerous restored mangrove sites in a cost-effective and ecological manner. 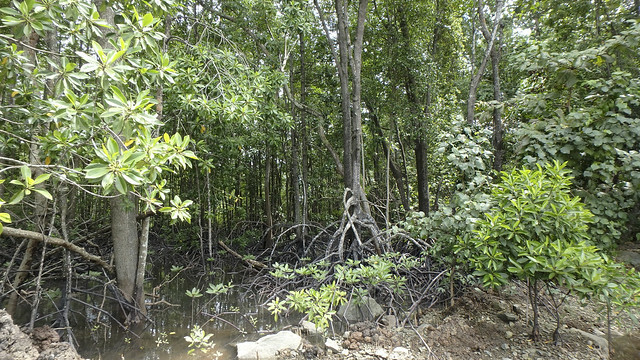 The Mangrove Action Project also applied Ecological Mangrove Restoration in Indonesia. Here is a series of photos of Ecological Mangrove Restoration in action in Tiwoho, Sulawesi from 2001 to 2011. (EMR took place in 2005). In a collaboration with Mangrove Action Project and a local university, Dr Dan Friess and his team was involved in applying Ecological Mangrove Restoration to restore a site in Makassar, Sulawesi, Indonesia. The site comprised 29 abandoned aquaculture ponds which faced a lot of erosion problems. A pre-survey was done in Sep 2013, restoration works carried out in Dec 2013, and a post-survey in Jun 2014. Six months after restoration works, seedling establishment was already happening. I want to know MORE about Ecological Mangrove Restoration! How will Ecological Mangrove Restoration be conducted in Pulau Ubin? Conduct baseline elevation surveys of abandoned ponds to understand their physical and hydrological condition. 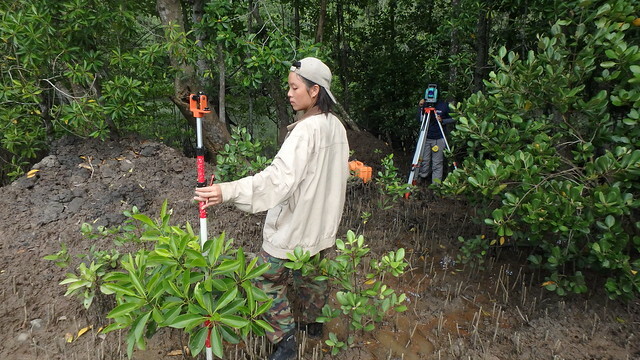 Conduct baseline elevation surveys of neighbouring natural mangrove forests, to understand species-specific requirements for restoration. Conduct baseline fish and bird surveys to understand the biodiversity of the proposed areas. After analysis of Phase I results and consultation with all relevant stakeholders, R.U.M. will design and conduct a pilot Ecological Mangrove Restoration project on Pulau Ubin, in conjunction with NParks and other stakeholders, as part of Phase II of this project. What else will be considered in mangrove restoration on Ubin? It is important to R.U.M. that the community who live on Ubin and who love Ubin have a part to play in mangrove restoration. 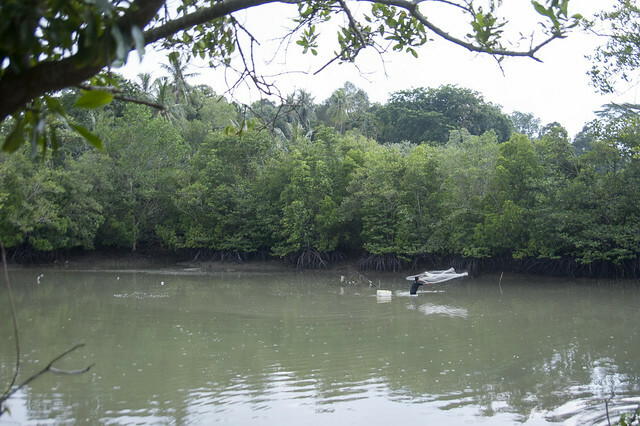 Our hope is to restore Ubin mangroves not just ecologically and biologically, but also their social and cultural role and value to the community on Ubin and beyond. Therefore, R.U.M. will be doing outreach to Ubin villagers, to update them on our activities and learn from them their memories about Ubin mangroves. We will also be sharing with the general public through monthly R.U.M. walks, as well as public talks and exhibitions. Can ordinary people help out in the restoration effort? YES! R.UM. welcomes everyone who cares about mangroves to help in our activities. More details here. How can I find out what R.U.M. activities are happening and how do I sign up for them? Upcoming activities will be posted on this blog and on the R.U.M. facebook group. These will include sign up processes. Subscribe to the blog and join the R.U.M. facebook group to get the latest updates. Contact us and we will try our best to answer them.